Dr.Malpani's Blog: Why do doctors get paid so little ? When I see patients haggling over the doctor’s fees, I am often confused by their behavior. There is not enough recognition in society about the value of a doctor’s hard work. I feel doctors and medical specialists are overworked – and underpaid. The general perception is that doctors are rich. 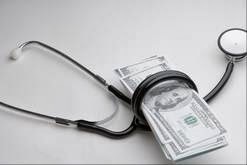 It is a common complaint of patients that doctors overcharge for their services , while the fact is that their fees are not commensurate with their efforts. Let’s compare doctors and lawyers. These are both learned professions , and medical students and law graduates need to put in a lot of hard work in order to quality. They get the coveted degree after years of hard work . The struggle to succeed in both the professions is the same, but the discrepancy lies in the fees they charge. An established lawyer earns more than Rs 1 lakh simply to appear in the court , while the doctor gets only a small fraction of the amount for making the right diagnosis . He is a knowledge worker as well ! Why is there such a vast difference in their fees? This reminds me of a joke. An MD sees his lawyer at a cocktail party and tells him, "I've already had three people ask me for medical advice tonight. How would you handle that?" "Send them a bill," says the lawyer. Three days later the MD gets a bill for $35 from the lawyer ! The fact is that doctors are expected to save lives and serve patients without considering minutiae such as monetary compensation. They are supposed to be selfless servants of society , who are expected to to do their job , regardless of whether they are paid or not. Because they train in government hospitals which provide free medical care, where money does not change hands, they do not learn much about the financial and business side of medical practise. On the other hand , because lawyers fight cases where crores of rupees are at stake, they are very comfortable asking for a slice of the pie – which is their fees are often in lakhs of rupees . I think it is financial naivete which stops doctors from charging for their services what these are really worth. If saving a company is worth crores, then what’s the cost of saving a human life ? How do you put a price to this ? Sadly, doctors have remained underpaid , and many are therefore unhappy and unsatisfied. There’s no need for doctors to be ashamed to charge for their services. Sadly, when they do so, patients complain that doctors have become mercenary and commercial ! This is the same patient who is happy to charge his company a salary of Rs 50 lakhs , just in order to close financial deals and push papers and files ! To break this vicious cycle, it is important that the doctors understand that they provide a valuable service and have the right to charge what is due to them. As I tell my patients, IVF treatment may be expensive, but a baby is priceless !